Staying abreast of the latest technology, especially in a field such as translation where there is so little public understanding, sometimes takes some effort on our part. And a great way to keep ahead of the curve is to attend industry events with like-minded professionals in our field. With this in mind, LKT translator and in-house CAT guru Lee Wilson tore himself away from project work ventured to London to attend the SDL Roadshow event. 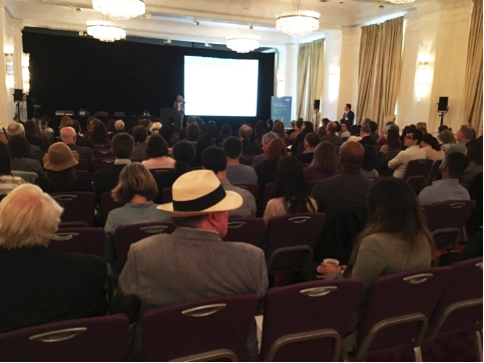 Held at the Hilton hotel near Paddington station, the event featured a variety of talks and presentations on recent trends in the language industry. For example, a comparison was drawn between the tribulations of the modern-day translator and the overwhelming challenges faced by the protagonist of 2016’s marvellous film Arrival. Following on from that, a fascinating panel discussion was led by Paul Filkin (of Multifarious Filkin fame) regarding some new features in one of LKT’s chosen translation tools, SDL Trados Studio. Studio’s brand new iteration, SDL Trados Studio 2017, now comes complete with its very own machine-translation engine – a system which learns from user input and incorporates stylistic elements into the engine’s translated output. While the self-learning potential of this system sounds interesting, we remain somewhat sceptical about its accuracy when it comes to the kinds of text we deal with on a daily basis. However, one feature which does have some promising advantages is Studio’s ground-breaking new upLIFT Fragment Recall function, which pretty much does what it says on the tin – it remembers fragments of text at sub-segment level that we have already translated in the past and recalls them for us so that we don’t have to resort to tedious concordance searches. If it works as intended, and we’re sure it will, then this will give our linguists a great deal of freedom from time-draining manual tasks and will enable them to focus purely on the translation task at hand. After a splendid lunch and some time for networking with other language professionals, an extensive CPD session was held on the topic of Studio 2017. The session also shone a spotlight on some third-party apps that can be plugged into Studio, such as an impressive text analysis tool and an embedded browser window for quick web-based research. All in all, there’s a lot for us to sink our teeth into in the coming weeks and months. And we’ll be sure to continue our presence at such events in the future!